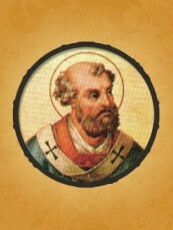 Pope St. Hilary was Pope from 461 to February 28, 468. He was the Sardinian Archdeacon of Rome, and was elected Bishop of Rome, the Pope on November 17, 461. As the Archdeacon under Pope Leo I, he fought hard for the rights of the Roman See. As Pope, he continued the policies of his predecessor Leo. He continued to strengthen Papal control over Episcopal discipline. Some of his Encyclicals were in the interests of increased discipline. A synod was to be convened yearly by the Bishop of Arles, but all important matters were to be submitted to the Apostolic See. No Bishop could leave his diocese without written permission from his metropolitan. Church property could no longer be sold, until a synod had examined the cause of the sale. He really had tightened the rules with Episcopal discipline. Pope Hilary gave decisions to the Churches of Hispania, which sometimes tended to operate outside the Papal orbit in the 5th century. Before the death of Nundinarius, Bishop of Barcelona, he expressed a wish that Irenaeus might be chosen his successor, and he himself had made Irenaeus Bishop of another See. The request was granted, and the Synod of Tarragona confirmed the nomination of Irenaeus, after which the Bishops sought the Pope’s approval. Elections and installations of new Bishops were done without his approval, making it necessary for him to exercise Episcopal Discipline. The Roman Synod of November 19, 465 was held at the Basilica of Santa Maria Maggiore, which settled the matter. It is the oldest Roman Synod whose original records have survived. In Rome, Pope Hilary worked hard to counter the new emperors 467 edict of toleration for schismatic sects. On one of the emperor’s visits to St. Peter’s Basilica, the Pope openly called him to account for his conduct, exhorting him by the grave of St. Peter, to promise that he would not allow schismatical assemblies in Rome. St. Hilary erected several Churches and other buildings in Rome, which he was praised for in the Liber Pontificalis. He erected two oratories in the baptistery of the Lateran, one in honor of St. John the Baptist, the other of St. John the Apostle. He also erected a Chapel of the Holy Cross in the baptistery, Convents, Two Public Baths, and Libraries near the Basilica of St. Lawrence, in which he was buried. He suffered from Neuropathy, and died while being Pope, on February 28, 468. Pope St. Hilary was Pope from 461 to February 28, 468. He was the Sardinian Archdeacon of Rome, and was elected Bishop of Rome, the Pope, on November 17, 461. As the Archdeacon under Pope Leo I, he fought hard for the rights of the Roman See and vigorously opposed the condemnation of Flavian of Constantinople at the Second Council of Ephesus in 449. He was noted for bringing Episcopal discipline to the Bishops of his time. He also built many Chapels and Buildings in Rome that remain today. He accomplished a lot in the short time he was Pope.